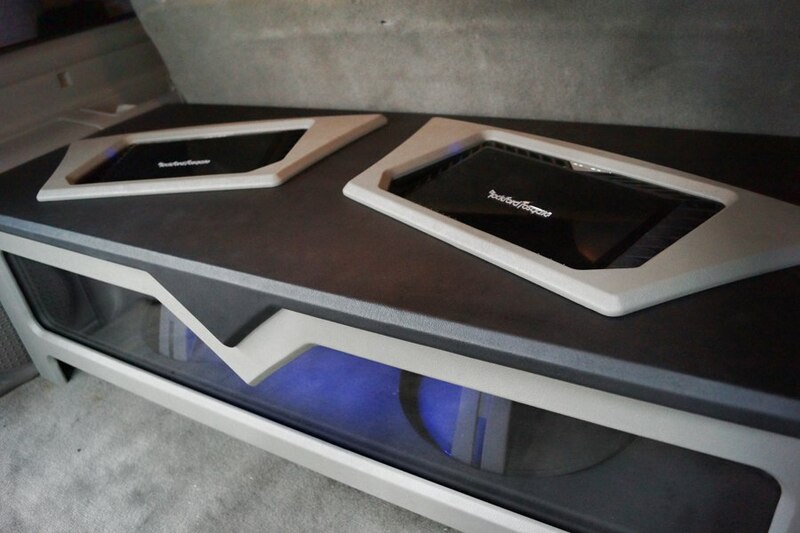 Custom Rockford Fosgate Sub Enclosure Speaker Box is one of those jobs that has you remember the bass. 2 15″ Rockford Fosgate subs give this Custom Sub Speak Box Enclosure all its rumble accompanied by 2 Rockford Fosgate Punch Amps. This Custom Rockford Fosgate Sub Enclosure Speaker Box was wrapped with black and grey leather, and black suede on the inside. To finish off the Custom Sub Enclosure Box, blue LED lighting was added to illuminate it for that extra pop! When it comes to custom car audio, sub enclosure, amplifiers, radios, navigation, or anything to bring a bang to your sound system, call Mr. Kustom in Chicago today! With over 30 years experience, we can turn your dream into reality. Mr. Kustom offers all major brands such as Rockford Fosgate, Kenwood, Alpine, Pioneer, and much more! All our work is custom built for the client, with their visions and thoughts in mind. If you’re interested in having a Custom Sub Sound Stereo System fabricated and installed for your vehicle, please call 773-583-3770 and speak to one of our specialist. This entry was posted in Blog and tagged 15" Subs, Blue LED Lighting, Car Audio, Custom Car Audio, Custom Sound System, Custom Speaker Box, Rockford Fosgate, Rockford Fosgate Amp, Rockford Fosgate Subs, Speaker Box, Sub Enclosure. Looking To Buy LED Door Projector Logo Lights?